I think it is safe to say that I am a moderately huge inFAMOUS fan. Putting those two words together is an oxymoron, but I would say that I am a moderate fan of inFAMOUS as it took me over 4 years to play inFAMOUS Second Son. On the other hand, I would say that I am a huge fan as I earned the platinum trophy for inFAMOUS 1 and 2 as well as 100% of the trophies for the Festival of Blood spinoff game (the shorter, weird, vampire game). I always wanted to play the latest inFAMOUS game, but I was a late PS4 adopter. By the time I received my console, I was playing the latest and greatest hits rather than one of the launch titles. But, I decided to bite the bullet and go back to Second Son to see how the game faired. I was expecting to have a great time as I had enjoyed messing around with the First Light spinoff game. Unfortunately, however, I kept thinking back to inFAMOUS 2 during the first few hours and was wishing that I was back in New Orleans rather than Seattle. There are not many sequels to preceding titles that I find inferior when it comes to gaming. For most games, sequels are either minor or big steps up from their predecessor. I rarely find them to be a step backward rather than forward. Off the top of my head, I can think of Mass Effect 3 being inferior to 2 and I preferred Battlefront 2015 to Battlefront II 2017. I am usually always on board for a new and improved sequel when it comes to gaming. This is why I was surprised to find myself bored with the first few hours of inFAMOUS Second Son. The first moments of the game felt promising as it introduced the main problems with the world and our protagonist. Delsin seemed interesting enough, but his cool beanie would not be enough of a character trait to carry the game forward. I found the dialogue to be fine, but the game’s humor slowly began to creep in and taint the experience. And, now that I am a few hours into the game, the humor does not stop. For me personally, I do not find the humor to be funny at all. Most of it is cringe worthy and just makes me roll my eyes. Too bad that the game employs the comedy angle way too often. I do like the beanie, though. But, looking past the dialogue, the game shows that Delsin does not have any powers, and he is just another human being. 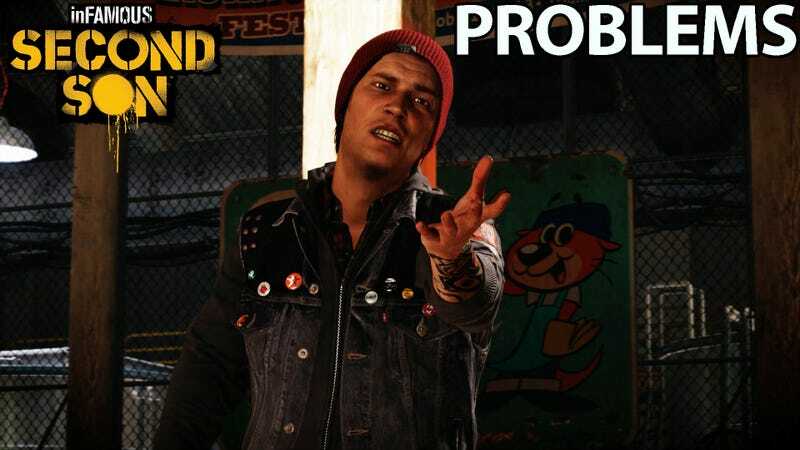 It would have been nice to establish his character and the world around him a bit more; however, the game chooses to jump straight into the major conflict by granting Delsin his powers after only a few minutes into the game. Within the first hour of Second Son, Delsin goes from being a fairly normal person, to gaining his powers, and then to mastering his powers. I know that playing for hours with no abilities could be boring, but I did feel that the intro of the game felt rushed. Even Delsin’s emotions changed from being an outcast, to being scared of his new powers, to feeling powerful, and to even feeling cocky. The tone of Delsin jumped around as much as he would jump around from building to building. I feel that these weren’t big problems in inFAMOUS 2 as Cole was already familiar with his powers and limits from the beginning of the game. His personality and abilities did not suddenly lurch forward like Delsin. I feel that Delsin would be a more effective character if he began the game with some sort of power and ability rather than gaining it after a few cutscenes. With the story, we are given the main problem and goal within the first hour as well. Stop the evil lady and help those in need along the way. That is pretty much the story of the game unless you decide to screw everyone over instead of helping them by going along the dark path. Very simple; very boring. I wouldn’t mind a simple backdrop if the characters and situations were more interesting, but everyone feels very bland and very much like an archetype rather than a human being. Evil lady is evil, and she has...concrete powers... Yes, that is her actual power. And keep in mind that I am not saying that inFAMOUS 2 mastered all of these areas. From what I can recall of inFAMOUS 2 (which is not a lot of story details), I do not remember any amazing and grandiose story or character moments. I do recall a lot of great moments, but nothing that is necessarily mind blowing or ahead of the pack in comparison to other games. I did find it enjoyable, though. With Second Son, I do not care about what is happening and who it is happening to. Even though it is important, let’s look past the story and move onto gameplay. Unfortunately, that also feels lackluster. In inFAMOUS 2, Cole wielded a plethora of different electrical powers and an awesome melee weapon. He could also use other elements depending on which missions you completed. In Second Son, Delsin also uses different powers, but they all manage to feel like bland, weaker, and even lamer versions of Cole’s powers. The first power you gain is smoke, and his melee weapon is a chain. The main purpose of the grenade ability is to literally make enemies cough so that you can take them down easier. Since Delsin can not use electricity, his movement is restricted to morphing into a cloud and moving through the air and air vents. The free flowing movement of inFAMOUS 2 feels like it is gone in Second Son as you can not travel across power lines or rails but can only travel through limited vents. Morphing back and forth from your human form to the cloud form makes the movement feel disjointed. The movement and combat feels like a drastic step back. Being a smoke monster breaks the flow of movement a bit, but it doesn’t grind you to a halt. The button layout of the controls even feels inferior as the hover mechanic is “X” rather than “R1", and the missiles and grenades are on “R1" and “L1" rather than triangle and square. Changing the layout from the previous title may not seem like a big problem, but I feel that the changes make for less fluidity when attacking and moving around the world. Hovering with “X” even made my hand sore for a couple days after playing for an hour the previous night. Speaking of the controls themselves, the shooting mechanics, movement, and even the drain mechanic feel worse in Second Son. I am still struggling with aiming in Second Son as it feels clunky and weighed down in comparison to inFAMOUS 2. The movement also feels less refined as I get stuck on the environment and struggle to move around. And the drain mechanic can not be stopped on a whim like in inFAMOUS 2. Stopping the drain mechanic allowed you to quickly gain a necessary amount of power and move on rather than completely filling a large chunk of your energy. It was not always necessary to fully top off when in the middle of a firefight as it could cause you to take damage. I find myself getting attacked in the middle of the drain process consistently in Second Son. When these three things come together, it makes the game feel like a clunky package where the game is fighting your every move. Rather than giving you full control over what you are doing, you are sometimes locked into actions such as having to sit through the entire drain process. The controls aren’t the greatest in Second Son. After the first few hours, the game does start to pick up and introduce new abilities which help the game to feel a bit better. However, I think that I will not be finishing the game for the time being. There feels to be too many problems which are not worth tolerating. It is unfortunate, as I wanted to love this game, but there is a sort of magic missing which makes the game feel like an inFAMOUS knock off rather than a deserved sequel. I even jumped back into inFAMOUS 2 for a few minutes to see if I was remembering the previous game correctly or not. I found myself lost in how great the movement and abilities felt. I was able to easily and fluidly fly around the environment and use my abilities to help me navigate the terrain and attack enemies. It felt more refined and polished than Second Son managed to feel. If we ever get another inFAMOUS game, I hope that it will look back at what made inFAMOUS 2 so great rather than what inFAMOUS Second Son tried to tack on. Second Son has some cool features that it tries out, but I feel that it ultimately becomes overshadowed by the game that it tried to live up to.